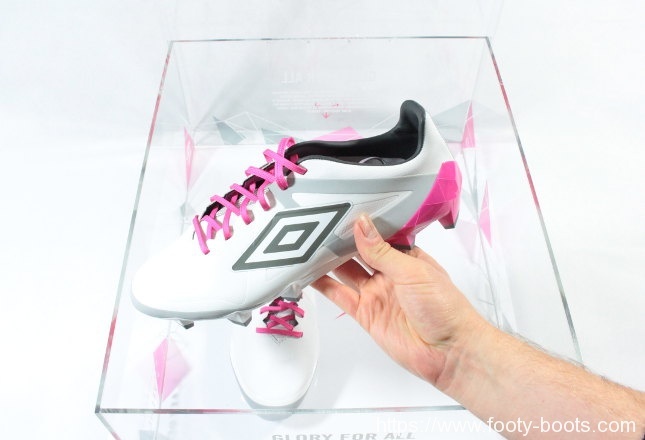 After knocking the football world off it’s feet yesterday with the arrival of the Umbro Velocita, a sizeable parcel arrived at Footy-Boots.com HQ, containing a massive presentation case for the newly released football boots. 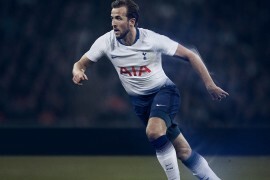 Of course, the first thing we had to do was get this stunning media kit in front of the camera for the full photo and video treatment, and let you know how we’re feeling about the latest release from the Double Diamond. 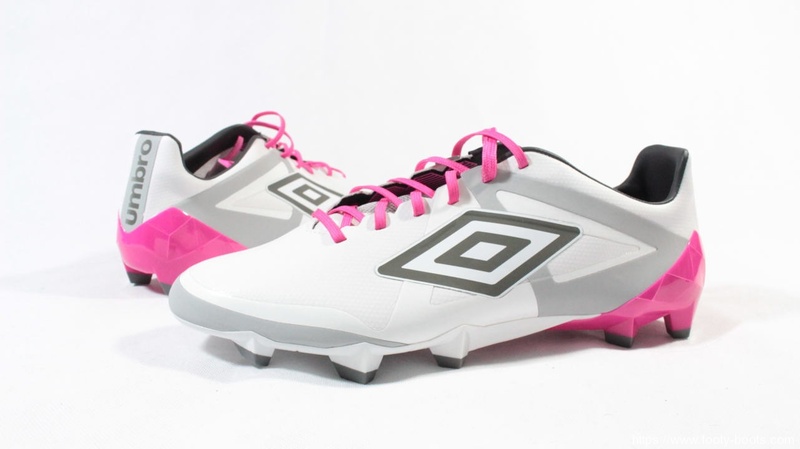 First off, we’ve got to give it up for the Umbro design team on both the Velocita boots and the case. The clean lines and linear patterns give the boot a clean, modern look, with the Pink Glo pop colour looking stunning off the neutral-coloured upper. The design theme continues around the lower half of the box, with triangles and polygons dancing around the bottom of the case, with the Velocita’s logo on the lid. 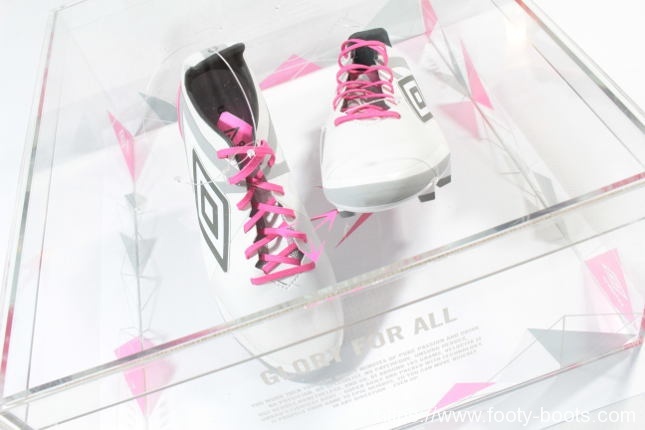 Umbro have also branded the box up with their ‘Glory For All’ mission statement, with the message that the Velocita represents the pinnacle of Umbro’s creative team – and the best that Umbro produce isn’t just limited to top players. 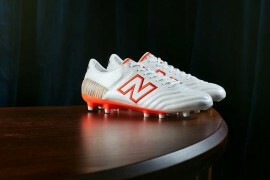 These boots are as good on a Premier League pitch as they are on a Sunday League one. 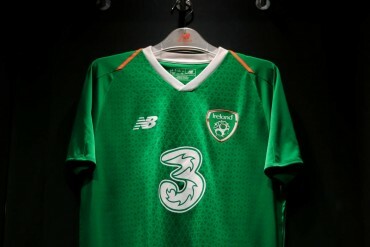 The Umbro Velocita itself is fairly remarkable bit of kit to behold, and a clear step up from anything lightweight that’s come out of Manchester before now. Whilst those sharp lines and angles that make up the design might not look all that comfortable, the upper on the Velocita is – without doubt – right up there as one of the softest we’ve felt. 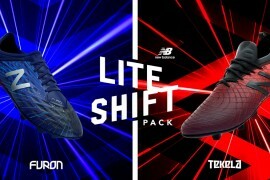 Not just on a speed boot either; Umbro are going toe-to-toe with the adidas’ Hybridtouch, Mizuno’s Primeskin and just about any other microfibre on the market right now and coming up looking good. Whilst we’re not sure about how much difference the golf-ball style upper will make to aerodynamic-ity (as stated in the press release) it does give the boot a definite sense of texture. 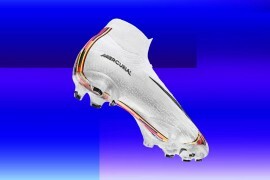 This gives it a sense of feel not dissimilar to the Dribbletex on the current f50 or the ACC on the Vapor X. You might notice that, barring the tongue, there is absolutely no stitching and the whole boot has a very seamless look. 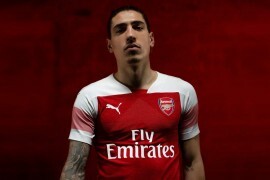 That’s down to Umbro’s decision to heat melt all together – their theory is that less stitching and gluing means less weight, and looking at the result we’re not about to disagree. 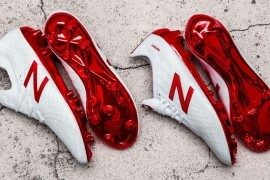 According to Umbro, the Velocita’s outsole has been geared for speed in any direction, with an emphasis on side-to-side stability as well as straight-line speed. 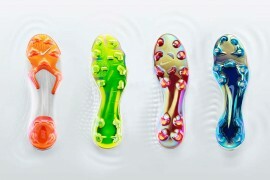 That said, the layout of the studs will seem familiar to a fair few other releases out there at the moment, with conical studs under the ball of the foot for ease of rotation, whilst the heel and lateral side of the boot are treated to diamond-shaped blades for stability when jinking, cutting and planting. This is one area of concern for us after a hands-on with the Umbro Velocita; the outsole is pretty stiff to try and bend in the hand, but we’ll reserve judgement until after we’ve trained in them a couple of times. 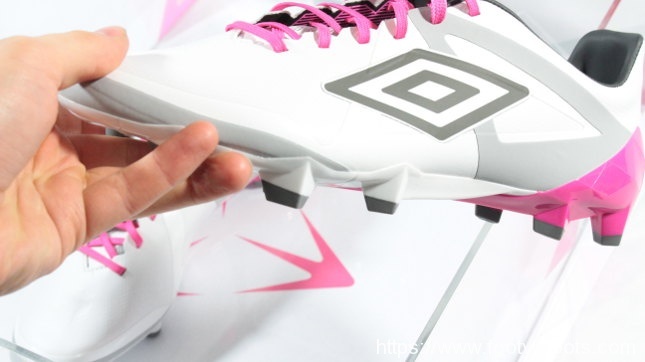 As you’re probably thinking now yourself, the Umbro Velocita certainly has all the components it need to be a great speed boot, but we want to know – is a it a boot you would consider?